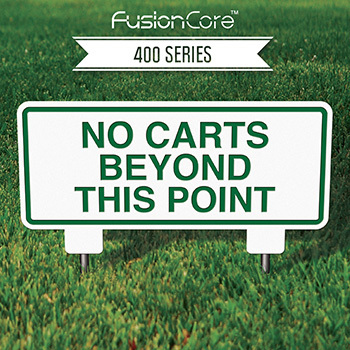 FusionCore is designed and engineered as a hard-wearing and practical solution for a wide range of directional, wayfinding and informational golf course signage. Our dimensionally engraved signs are crafted from a high impact resistant, multi-layer polymer that is durable, strong and can withstand abuse from nature OR man. FusionCore signs will not deteriorate, delaminate or warp when exposed to the harshest of elements or golf course chemicals. You’ll have no worries about the occasional errant golf shot or accidental collision with a golf cart. Our signs cost significantly less than many other sign material and are affordable to replace if misplaced or stolen. FusionCore golf signs are available standard with a green background and white lettering or white background with green lettering and graphics. FusionCore signs are expertly engraved to create bright and highly visible messaging. FusionCore products are also available in 16 other options to meet your more custom needs. We offer seven distinct series of classic sign styles that come fabricated and ready to be quickly and easily installed on the course.